It might be the first few days of December, but Old Man Winter is not playing nice in San Antonio. In fact, he seems to not even be anywhere near us. Truth–the windows in our house are open. It’s that pleasant outside. And that puts a serious stumble on my meal plan. Thank goodness I started subscribing to Saveur’s weekly emails that are generous with ideas. And recipes. (Just scroll to the bottom of the website home page and smack dab in the center of the bottom you’ll see “newsletters” and you can sign-up.) An email arrives in my Inbox every Monday and this week’s daily menu ideas gave me something to live for. Shrimp fritters. Coincidentally (though you do remember that there are no coincidences), this recipe is featured in this month’s issue, which I obviously have not taken the time to read yet or else I would have already been making these crispy little brown fritters that can be made gluten-free and require neither eggs nor dairy. It calls for chickpea (garbanzo) flour and all-purpose flour, but I replaced the all-purpose flour with a little rice flour, though potato flour could alternatively be used for a grain-free recipe. What I especially liked about making this for dinner is that our freezer is filled with a very large and bulky, 5 lb. bag of shrimp right now and they are taking up entirely too much room. So you see, this fritter recipe will serve dual purposes. It will provide us with a healthy meal and make a dent in the giant bag of frozen shrimp. And if you have any fabulous shrimp recipes, please send them my way. I love fritters. These bite-sized little flavor pockets can change depending on the ingredients, but remain essentially the same. Delicious. And healthy. I have made zucchini fritters, corn fritters and others and these rank right up there in the fritter world. It's just what you would expect to find in a tapas bar in Andalusia, the southern region of Spain. Heat 2 tablespoons oil in a 12" skillet over medium-high heat. Add the onions and cook, stirring until soft, about 6 minutes. Transfer onions to a bowl and add the shrimp, both flours, parsley, baking powder, paprika, a dash of salt and 5 tablespoons water and stir to combine thoroughly. Set batter aside to rest for 10 minutes. Using the same skillet, add the remaining oil and place over medium-high heat. Working in batches, use 2 tablespoons of the batter for each fritter and cook, flipping once until golden brown and crisp at the edges, about 3 minutes. Using a spatula, transfer the fritters to paper towels to drain and immediately season with flaky salt like Maldon and freshly ground black pepper. 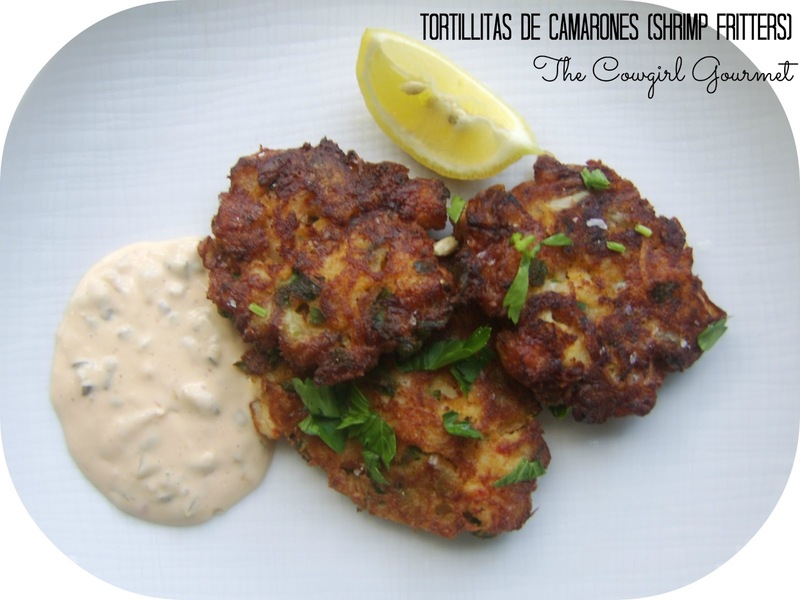 Serve with lemon wedges and remoulade sauce. Squirt the lemon on the fritters, dip in sauce and enjoy.